Never Mind is the first of the Patrick Melrose novels, a copy of which I was thrilled to discover our library actually owned. (What? Amongst all the Nora Roberts novels there could be found a work of true literature?!) 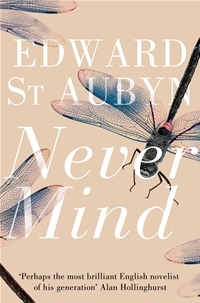 I have been savoring Edward St. Aubyn’s writing, taking all day to read Never Mind which is a mere 127 pages. As for Patrick’s mother, she has become so humiliated in her efforts to please her husband that she now is practically paralyzed to say or do anything contrary to his wishes. Even defending her son becomes impossible for her to do. No matter how many justifications she tries to make, how many excuses she can conjure up, the fact remains that she is as terrible a mother as David is a father, and it is no wonder to me that when the second novel opens up, Patrick has become a heroin addict. While all the story line here seems dreadfully depressing, and I suppose it is, the writing is sublime. Edward St. Aubyn does a masterful job at pointing out, with great satire, the flaws of the British upper classes. Which seem applicable to any set of people who are consumed with status, wealth, image and beauty, while trying to cover up addictions, perversions, and more insecurities than any psychoanalyst could identify in a single session. I’m beginning Bad News tonight, which I will follow with Some Hope, then Mother’s Milk. These are the first four of the Patrick Melrose novels, and Picador will release the fifth one entitled At Last on April 12, 2013. I've read about this author but never got around to actually reading his books. I would love to read about the upper classes of England. I had not heard of this series before, but you made me laugh with your line about real literature among all of the Nora Roberts novels. I hope you enjoy the rest of the series just as much as this one! I'm not familiar with this series, but I would love to try it. I think the writing is pretty awesome as well. That passage about the snail is just really perfect. I've worked at a daycare (first job out of high school) and a Montessori school, and you can genuinely see all that cross a child's face. Thanks for sharing. I need to look this one up. I'm thrilled to know you're enjoying this book. St. Aubyn's writing is beautiful. I was completely unfamiliar with this author and, while scanning the shelves at a local book store, I came across a volume of the Patrick Melrose novels. I read a little about them and then part of 1 chapter. !Of course, I took it home with me. I haven't had the chance to read it yet but I'm even more excited about this book, now. I love these snippets you've shared! St. Aubyn has been on my 'to read' list for ages. This sounds like the perfect place to start. The snippets of St. Aubyn's writing are so powerful that I often have to stop and reread a sentence several times. I'm halfway through the second book now, Bad News, and I think when I 'review' it I'll simply put the quotes which struck me so forcefully. His writing is really incredible, and the novels are short in case you feel pressed for time. I was so glad that our library had a copy! (Glad and surprised!) I think I'm going to pre-order At Last because I want to keep reading them all the way through the 'series'. I thought the same thing, Picky! He captured the thoughts and actions in a child's mind so well that I could remember being a child myself as well as connect Patrick to the children in my classroom. I guess that makes it doubly sad that Patrick's child is so horrible. Diane, I hope you have a chance to pick up one of the novellas. They're short, and they're marvelous! They make most of the other books I've read this year seem very trite. It was lucky for me that I read the ad from Picador, or I'm not sure I would have been aware of them either. It's hard, sometimes, to be aware of the great British literature here in the US. Not only upper classes, Mystica, but dysfunctional people. Their stories are fascinating, horrific at the same time. I think Francine Prose writes about him in her book Reading like a Writer. In any case I got Mother's Milk on my piles and would like to read it. The language is so beautiful.I wasn't aware that this is almost like a series. I guess one can read them out of order. I think you can, of course, read them in any order. But, I'm finding a cohesive in following Patrick's childhood to his early 30's and beyond. His heroin addiction in Bad News is so awful, but the reader understands after reading about the way his father treated him and his mother was powerless against it. I guess the themes are really heartbreaking, but the writing is so wonderful I'm not as troubled as I imagine myself feeling in the hands of another writer. This has appeal, probably down to its class satire. These books are on my 'must get to someday' list, as I have heard such good things about them. Thank you for the lovely review, and for bringing St Aubyn to my attention again!